Earlier this year, I wrote a couple of posts about a plastic yellow box full of handwritten and clipped recipes that I had purchased for $1 at a flea market. I still haven't discovered who the owner of this collection was, and I probably never will. 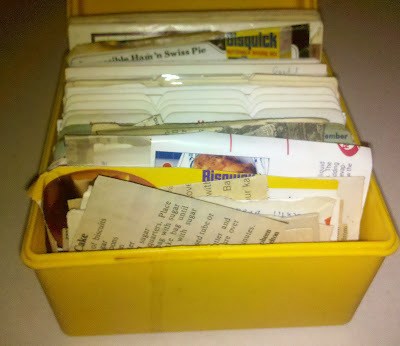 But we can continue to share the recipes that were found within in. During the upcoming week, I'm going to publish a yummy handwritten dessert recipe from the collection every night at 8 p.m. (EDT). Maybe you'll be inspired to share some of these and/or try them during the upcoming holiday seasons, keeping alive the spirit of this southcentral Pennsylvania homemaker's kitchen. 1 bag tidbit choc. morsel — 12 oz. Melt Margarine & morsels. Remove from heat; Add coconut & Marshmallows. Stir. Pour onto waxed paper & form log. Refrigerate until hard, then slice. Other versions of this colorful recipe — you're supposed to use colored marshmallows, of course — can be found at allrecipes.com, cooks.com, Rachael Ray's website, and MrFood.com. Come back for another dessert recipe tomorrow night! 1. 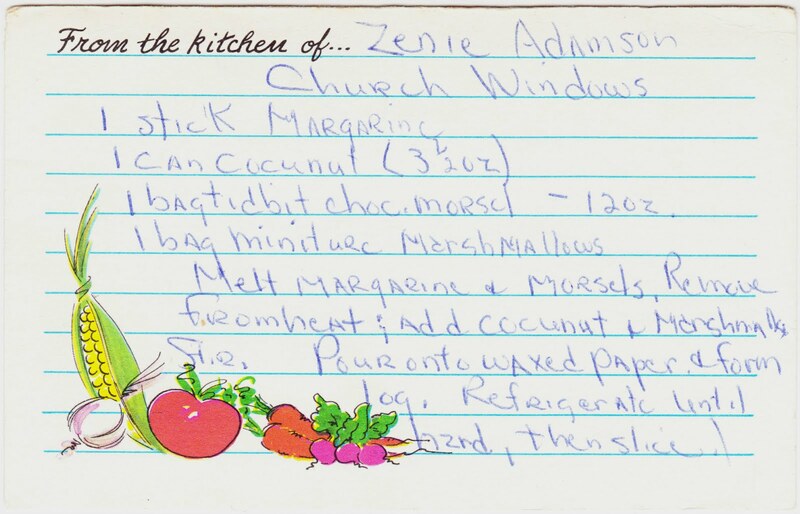 As you can see from the recipe notecard, the author misspelled coconut throughout as cocunut. I found that cute, but didn't see a need to replicate the spelling.